This is my new endeavor. I am making this Afghan, two squares a week since late January 2006, until done, in my MSN group. http://groups.msn.com/crochetdepot . I believe this Afghan is a great asset to anyone who does crochet or who wants to learn to crochet as it is a wonderful experience making 63 different squares. Some of them are difficult, some easy. Here you see the ones for this week, number 5 and number 6. Number six is called the trinity stitch, very cool stitch. 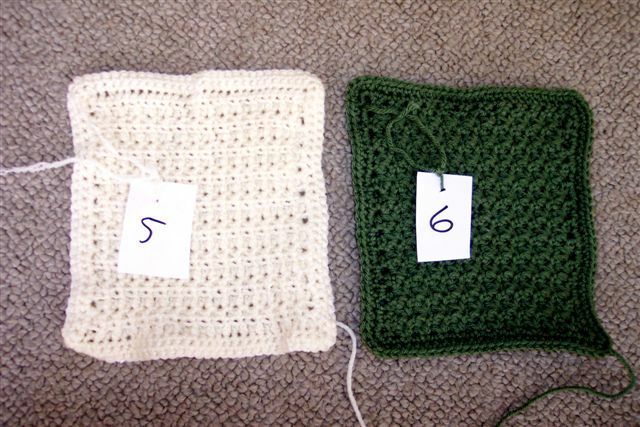 One thing that you can do with this pattern-book, is use your yarn remants and you may want to number them, even though I see no real importance in numbering them, because they are all stitched together later one. Thanks for stopping by and for allowing me to share my craft with you. I am also busy putting together another afghan for charity. This week I am working on square #7 and #8, using different colors than the book says. I just don't want to buy any more yarn, I don't need to. This Afghan may be for me or for charity. I am plaaning to mae one in light yellow, ecru or beige or even brown cotton for me some time in the future. Cotton is a great fabric for the tropics. Come back and see what I am up to. 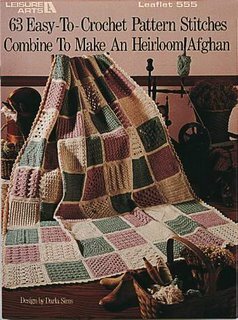 I've always wanted to try an afghan like this! My problem is that I learned to crochet from some old Italian ladies when I was a child. I can do all kinds of stuff . . . but I can't read patterns. I've never quite figured it out. I just need someone to show me how it works. the squares will be awesome!! I've seen that book and my partner wanted to try it but instead did his own thing. I had no idea you could do rinity st. in crochet .That looks great!